A short detour today from our reprinting of Herriman's Los Angeles Examiner cartoons. I just scored this sample of Herriman's ultra rare series called The Amours of Marie Ann Magee. 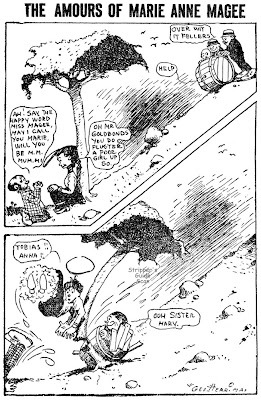 This two panel toon was syndicated by World Color Printing, one of their earliest and least successful attempts to expand their successful Sunday comics business into daily strips and panels. This Herriman feature , and the rest of their small batch of pretty darn awful dailies, ran in very few papers; in fact the only one that I've found running the material was the Washington Star. The feature ran for just eight installments from July 11 through August 9 1906. I'd love to share more of this series with you but the microfilm of that paper is so dark I was unable to make copies that were much more than black blobs. Lucky for me I found this single sample tearsheet for sale on eBay. One correspondent asks if I had a hard time getting started. Two years and a half after I started my first correspondence course in drawing I sold my first comic to the American Boy for $6. That was in 1906. I had taken a correspondence course from the National School of Illustrating, In­dianapolis, Ind., and spent a few months at their resident school in 1904, also studied with J. H. Smith, contributor to Judge from 1904 to 1907. Took cor­respondence course in cartooning from Acme School of Drawing, Kalamazoo, Mich., 1905. Attended their resident school a few months at the start of 1906. In May same year obtained my first position as cartoonist on the Kokomo, Ind. Dispatch. 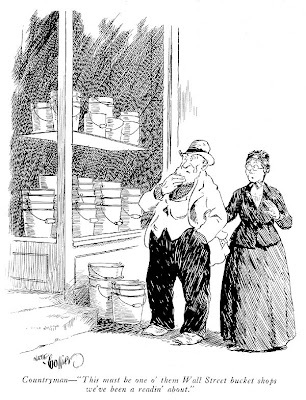 In 1907 I sold a dozen or so drawings to Judge's amateur con­test and also freelanced comics to The Chicago Daily News. In 1908 took Lockwood's cartoon course and worked in a country print shop at $6 a week to get enough money to attend his resident school. Went to Kalamazoo in January 1909 and remained a couple of months, continued selling comics to Chicago News, and sold my first draw­ing for the regular pages of Judge. Later in the same year went to Sandusky, Ohio, as cartoonist on the Star Journal of that place, remained there until November 1910. Sold my first drawing to Life in 1910. From 1911 to March 1913 I conduct­ed a humorous column, made sport car­toons, and illustrated the Sunday Mag­azine Section for the Duluth, Minn., News Tribune; also freelanced work to Hope, Coming Nation, News Times,and sold a few to Life and Judge. In 1913, '14, '15 to May 1916, Car­toonist, Chicago Daily Journal and free­lanced a lot of comics to The Motion Picture magazine. From October 1916 to October 1917 animated ads for a Cleveland Ohio Film concern. Came to New York in October 1917. 1917, 1918 and 1919 Animated Katzenjammer Kids, Happy Hooligan and Jerry on the Job. Had comic strip put out by International Syndicate of Balti­more, Md., called "Our Own Movies" and sold a number of drawings to Life. 1920, Made "Our Own Movies," was cartoonist for The Associated News­papers. Freelanced to Life, Judge, Harpers, Brownings Magazine, Car­toons magazine, etc. 1921. Freelanced to Judge and Fun Book and animated Mutt and Jeff. 1922. Freelanced to Judge and ani­mated Aesop's Fables, and with Hearst Syndicate a while. Since April 1923 have had my studio at home and am at present doing work for Saturday Evening Post, Life, Judge, Harper's, McNaught Syndicate, The World Color Printing Co., of St. Louis, and others. From 1909 to 1919 I submitted over four hundred drawings to Life out of which I sold 14, and I have made enough comic strips, that never landed to keep a syndicate going a year or more. Most students think that they are ready to hold a position long before they are. It takes years of study, persistence and a never-give-up attitude; and above all a love of the work for the work it­self to overcome all obstacles and dis­couragements. I'll add that Collier was then doing the art on Kelly Kids for World Color, but would give it up in the next year. His only other verified newspaper credit is for Goofus Animals which he did 1930-31. He's listed in E&P for a few other later features I've not been able to find. Collier was much more successful selling freelance gag cartoons, which he placed in not only the A-list magazines but lots of trade, semi-pro and oddball publications. 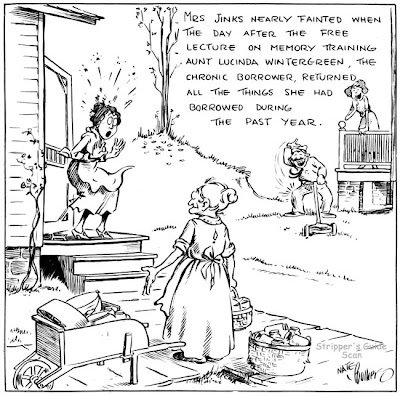 Allan, the Library of Congress possesses the original drawing for the single panel cartoon that begins with Mrs Jinks nearly fainted... - it's in the Art Wood Collection. The title is Buckeye Corners but the year is scratched out of the little circle that follows his signature. Any clue about when or where it might have appeared. I have no info, except an editors mark 4" under the drawing. Sorry, but I'm not aware of a series by that name. Considering that Collier would place his cartoons in any backwoods publication willing to write out a very tiny check, it could have appeared most anywhere. The fact that the year is scratched out indicates he was probably trying to resell it later to another publication, too. Sara -- ...but you're probably asking where I came up with the image shown with this post, just realized. I had a photocopy of the original art, probably from one of Jim Ivey's old sales lists. 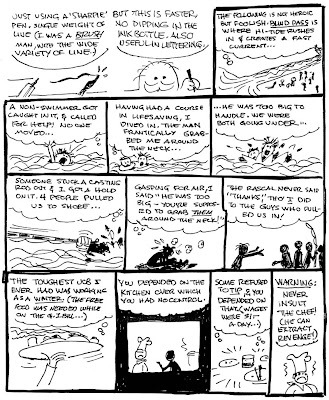 I think this feature may very well take the grand prize for the longest comic strip title of all time. 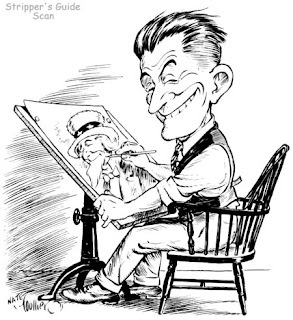 Edward Geller produced the Sunday strip for the Detroit Free Press starting in 1947 and continuing at least through 1951 if not longer. The strip told text-heavy inspirational biographies of industrialists and businessmen. The strip was copyrighted to E. and I. Geller, but nowhere in my documentation of the strip is there any mention of the identity or role of this I. person. According to Geller the art, which was usually drawn anonymously, was by Frank Williams. However, I have samples (one shown above) signed by Max Rasmussen, and the uncredited strips are in at least two if not more styles, so others were also involved. Edward Geller of the Detroit Free Press advertising staff is the creator of "The Story of An Ambitious Man," Free Press Sunday comic section feature which won sec­ond place in the cartoon strip cat­egory of the Freedoms Foun­dation Awards. (E&P, Feb. 24, page 13.) Mr. Geller received a medal and $300. The organizer of Freedoms Foundation, E. F. Hutton, and Guy M. Rush, vice-chairman of the group, had this to say about Mr. Geller's feature: "We do not know who killed Horatio Alger but you have brought him back to life." 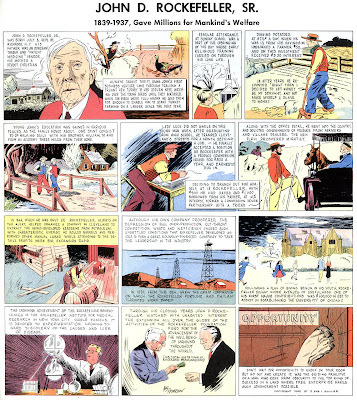 "The Story of An Ambitious Man who made jobs for thousands through free enter­prise," depicts in full-page color cartoons the lives of men who have progressed from rags to riches in the best American tra­dition. The series has appeared since 1947. 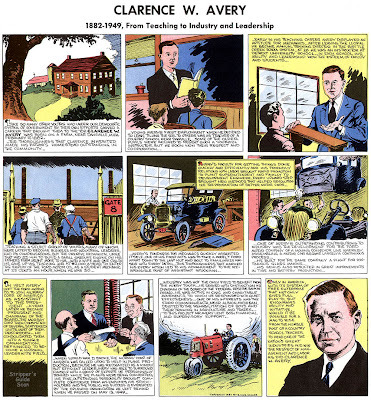 Mr. Geller has told the car­toon-stories of Henry Ford, Thomas Edison, John D. Rocke­feller, Walter P. Chrysler, S. S. Kresge, Bernard M. Baruch, C. F. Kettering, R. E. Olds, K. T. Keller, William Knudsen, the Dodge brothers and many others. He is working on a book of the cartoons which already have appeared. He said he will dedi­cate the book to C. W. Cosgrove, advertising director of the Free Press, because of Mr. Cosgrove's encouragement and aid. "The Story of An Ambitious Man" now has 160 sponsors, most of them presidents or board mem­bers of Michigan concerns. Mr. Geller, 57, has been a cre­ator of special pages for the Free Press for 15 years. Note: the samples reproduced above are from the reprint book - the strip as printed in the newspaper also included a large title panel and was printed at full page size. Sir, Thank you. Edward Geller is my Grandfather. A man I never met. I read about this strip but untill now I have not had a chance to see one. Is there anymore? Help Needed - Napoleon on Film? Today I won't be imparting information, I'm looking to be a consumer. I've been talking extensively with Jay Lafave, who is the son of syndicate owner Arthur J. Lafave (of the Lafave Syndicate, natcherly), and a few points have us stumped. They all involve film adaptations of the comic strip Napoleon. His brother distinctly remembers that there was a feature-length movie of the Napoleon comic strip produced in the 1940s. He recalls that it was shortly after the war, it was live-action and it was on the short side, so presumably a B-movie. He recalls watching it in a Cleveland theatre. The Lafaves don't recall much more about it except that documentation in their files might indicate that it involved director/producer King Vidor, MGM, or a production company called Viking Productions. I checked IMDB and can find no trace of such a movie. Can anyone help? Jay also has documentation that indicates Napoleon cartoonist Clifford McBride was filmed at work for an episode of the Unusual Occupations series of theatrical short subjects. Anyone know if the filmed segment made it into a finished episode, which episode he was in, or whether the series exists on video? Lastly, were there ever any Napoleon animated cartoons? Much thanks to anyone who can help us out. Lafave is trying to get his memories of his dad's business down on paper for posterity and these questions have us all baffled. Hello, Allan----Viking Productions was the name of King Vidor's own company. As for animation, Clifford McBride was a friend of cartoonist/puppeteer Bob Clampett of BEANY AND CECIL and Warner Bros. Cartoon fame. In the mid-40's, Clampett produced a short pilot film for a proposed series, using stop-motion figures of NAPOLEON and Uncle Elby. Vague reasons of "not being able to secure rights" is often given as the reason it never got off the ground, Clampett himself not being very helpful on this odd aspect of his career. ------Cole Johnsing. Hello, Allan----From MINDROT #13, Nov. 1978: BOB CLAMPETT interview by Jim Korkis: "There were two well-known characters I was interested in filming. One was Edgar Bergen's CHARLIE MCCARTHY and the other was Clifford McBride's NAPOLEON AND UNCLE ELBY, a popular comic strip featuring a dog with very human reactions. After stirring Cliff's interest, I worked up a NAPOLEON puppet.....But I wasn't just going to do NAPOLEON as a puppet show. I planned it as a live action series with a real actor playing Unle Elby. McBride felt that Gene Lockhart would be perfect. And I was going to use a trained dog whose body and size matched Napoleon's. But, it was impossible to find a dog that had a face that looked like Napoleon. So, what I planned to do was to build a life-sized head with the comic strip dog's likeness, that would fit over the head of the actual dog. I would film the long shots of Uncle Elby and Napoleon with the dog wearing the false head. Then for close-ups I would film a puppet head which was an exact duplicate of the one on the dog. Now, the dog as drawn in the comic strip had wonderful human facial expressions. It was for this puppet that I originated the method of doing facial expressions such as the smile, the frown, etc. Then we ran into some sort of problem with the rights. So I transferred all the development of multiple facial expressions to my Cecil puppet....." Well, that doesn't indicate whether they even completed a NAPOLEON film or not. Perhaps the results weren't all that good, I mean, an artificial head on a dog? !------Cole Johnson. That sounds truly awful. Thanks for the info, though! Few Sunday comic sections of 1903 were considered complete without a healthy dollop of racial stereotyping. It wasn't limited to blacks, of course; the Irish, Germans, Jews, Asians and more were all fair game for lazy cartoonists. The accepted wisdom of the day in cartooning was that every gag was funnier if the characters spoke with an accent or dressed differently. And if you couldn't come up with a gag at all just kick that race even harder - the results will be hilarious. The St. Louis Globe-Democrat Sunday comics section was, as we've discussed before, pretty well a one man show. DeVoss Driscoll supplied Nebuchadnezzar and Rastus Johnsing about a black man and his donkey on a semi-regular basis from November 22 1903 through April 3 1904. Not a strip to put in the time capsule, that's for sure, but we do get Driscoll's delightfully loopy animals in a starring role. 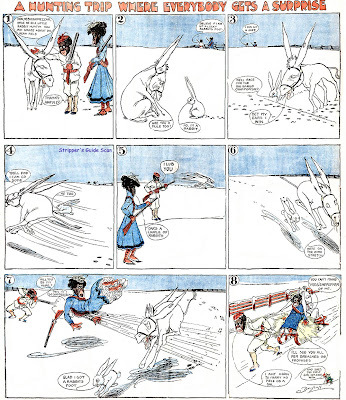 Barely qualifying as a continuing strip, Mr. Bunny's Adventures ran just four times between April 26 and May 10 1913 in the Boston Post. H. Boyleston Dummer, discussed before on the blog, put his expertise at drawing cartoon animals to good use on this very short-lived feature. Apparently Dummmer and the Post just couldn't fit together because in total he only cartooned for them for about two months, probably trying out for the spot that was being vacated by O.P. Williams. After a few more false starts with other cartoonists the Post pretty well settled on syndicated material for their daily comics.